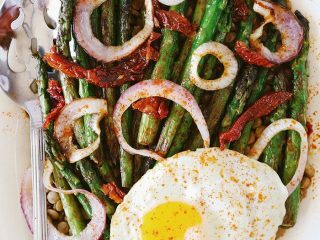 Served warm or cold, this Easy Lentil Salad with Asparagus & Sun Dried Tomato is a quick weeknight favorite – and perfect for lunch leftovers the next day! This Easy Lentil Salad recipe can be customized to any season, ingredients or cuisine. 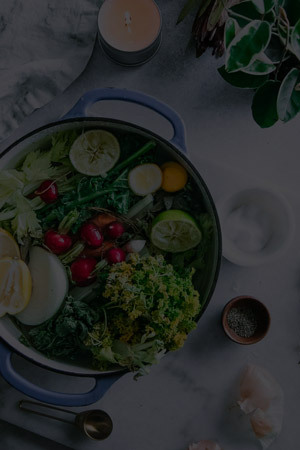 Find more Easy Weeknight Meals to take the guesswork out of your week and leave you more time to do the things you love! I’m just gonna say it: I really don’t like cooking on weeknights. Between a two hour daily commute (yup), long workdays and (too many) outside-of-work professional commitments, trying to cook dinner every night and bring lunch to work the next day gets lost in the shuffle. It’s overwhelming if you don’t have a meal plan for the week, and even if you do it’s not ideal to spend an hour in the kitchen while trying to have a balanced life (ha!). 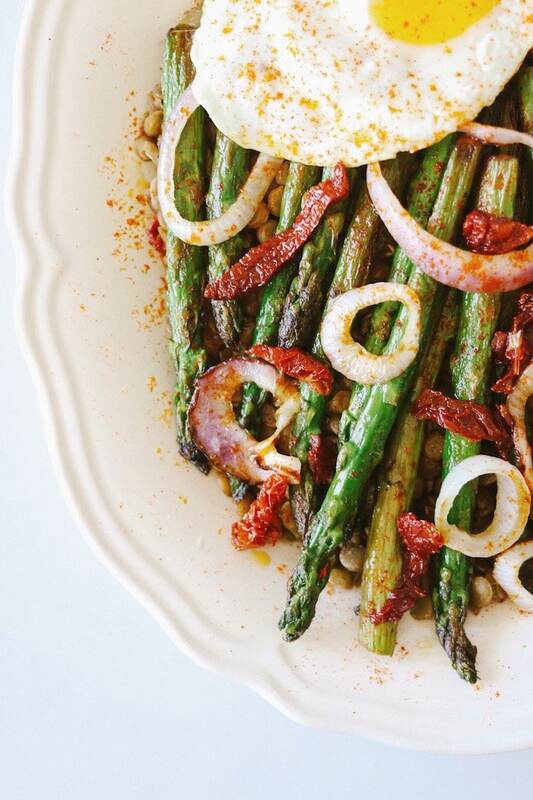 Enter the easy weeknight dinner. Every home cook should have 10-15 easy weeknight dinners under their belt that take 30 minutes or less. Sometimes it’s nice to spend a little more time on a fancy meal, but most nights my view of cooking dinner is “get in, get out, make sure there’s enough for lunch, and let’s hope it tastes good.” Sound familiar? Well, I’ve got your back. Lentil salads and grain bowls get a bad rap on social media for being “basic” but guess what: being basic is what makes them so great. Salads and bowls made from lentil and grains are the ultimate kitchen chameleons; they can adapt to any vegetables and herbs you have in the fridge and can be dressed up or down based on how you feel that night. Want to be fancy? Not into cooking and just want something bare bones? Easy lentil salads and grain bowls go both ways. Check out my So Easy Lentil & Farro Bowl recipe here, it’s where my love of lentils began! Lentil salads and grain bowls get a bad rap on social media for being “basic” but being basic is what makes them so great. Let me just admit to something: until relatively recently I had no idea how to cook dried lentils and beans. I bought them preprepared every time. This may make other dietitians, chefs and accomplished home cooks cringe, but it’s the truth. And if it’s the truth for me then there are likely a lot of people interested in making lentils who don’t know what to do with them. Prepared lentils and beans will yield double of the amount from dry. In other words, if you want two cups of lentils when you’re done cooking then cook 1 cup dry. This is not an exact science, but is a good general rule of thumb (cooking never is an exact science, however baking is – and this is why I’m not a baker). Use double the amount of water to dried lentils or beans. When I first began making lentil salads from dried beans I had no idea how much water to use compared to beans, especially when I bought beans in the bulk section and there were no instructions on the package. A good rule of thumb for preparing dried lentils or beans is double the amount of water to lentils. For example, if you are making 2 cups of lentils then you will want to use 4 cups of water, 3 cups of lentils needs 6 cups of water, etc. Add beans and water to pot, bring to boil, reduce to simmer and let sit until water is absorbed and lentils/beans are soft (20-25 mins). That’s it! Not only is it super easy to cook dried lentils, but if you start them at the beginning of your cooking time you are able to prepare the rest of your dinner while they cook. Easy and efficient (and delicious). 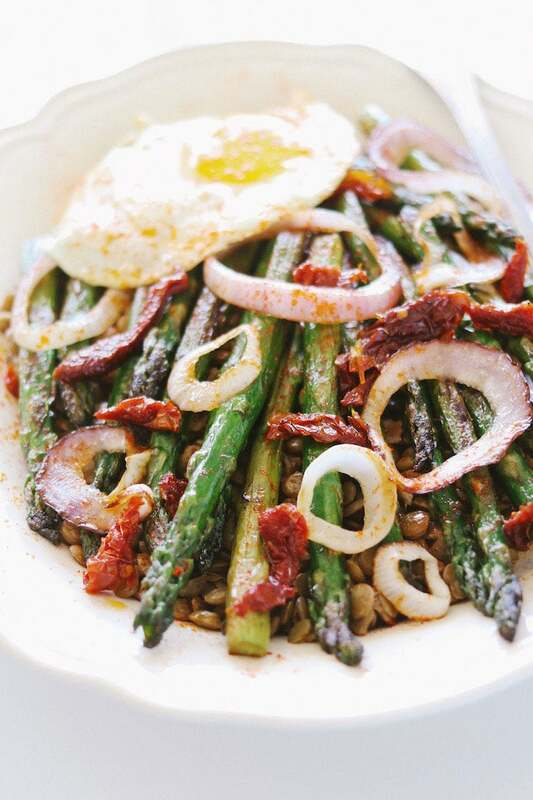 The lentil salad recipe below takes advantage summer with roasted fresh asparagus and sun dried tomatoes (tomato season is here!). The beauty of the lentil salad is that you can customize it with anything you’d like – just search what’s in your fridge! Looking for a great chart for what’s in season? I live by the CUESA Seasonality Charts. These seasonal charts lists all fruits, vegetables, seafood and flowers that are in-season in the San Francisco Bay Area, but is a good guide for what is seasonal nationwide. Check out resources for seasonal fruits and vegetables in your local area! 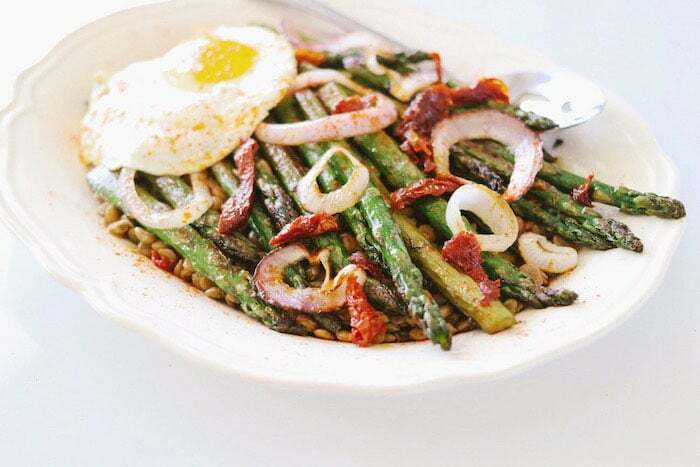 Served warm or cold, this Easy Lentil Salad with Asparagus & Sun Dried Tomato is an easy weeknight favorite, and perfect for lunch the next day! The recipe is easily customizable for season, cuisine or whatever you have leftover in your refrigerator. 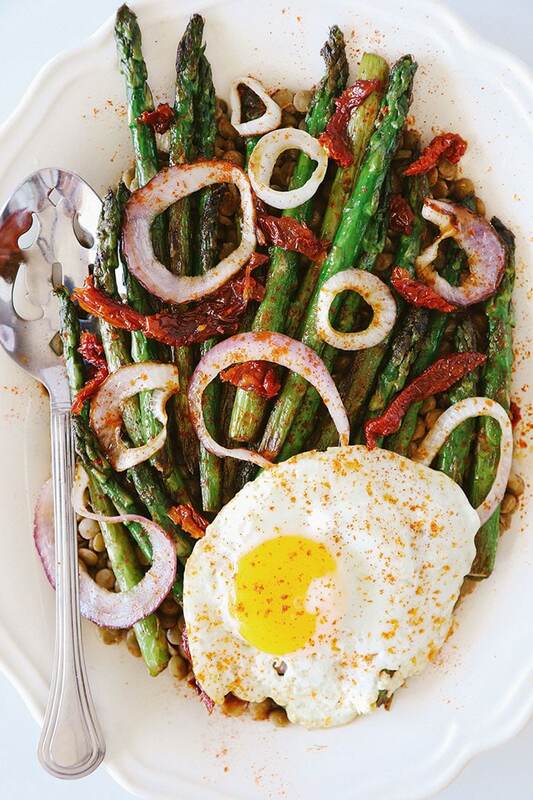 Make this easy lentil salad recipe a weeknight dinner staple! In a large part, bring 2 cups lentils and 4 cups a water to a boil. Once boiling, reduce heat to medium-low and cover. Cook for about 20 minutes or until lentils are soft and water is absorbed. Meanwhile, heat olive oil in large pan over medium heat. Add onion and garlic and cook until soft, about 3-5 minutes. Add sun dried tomatoes with oil they are stored in, and cook another 1-2 minutes. Remove from heat and set aside in a small bowl. Heat same pan (not washed, we want to use the leftover oil) to medium-high and cook asparagus 5-7 minutes, or until stalks begin to soften. Move frequently to brown all sides, but don’t overcook. 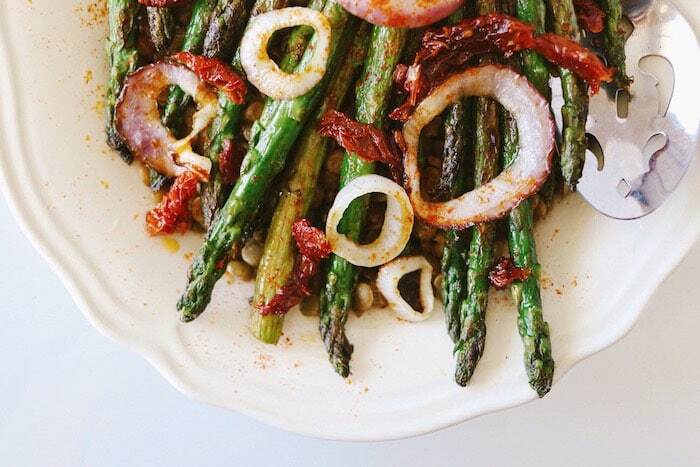 Asparagus tastes best with a little crunch. Lightly add salt and pepper before removing from heat. To cook egg: Bring same pan to medium and crack 1 egg per serving (cooking for 1? use one egg. 2? use 2 eggs). Cook over medium heat without touching egg for about 5 minutes, or until egg white is cooked throughout but yolk is still soft/runny inside (sunny side up). Put it all together: When lentils are soft, drain any remaining water and put lentils back in large pot. Dump onion, garlic, sun dried tomato and oil mixture on top and stir well. Transfer mixture to bowl or plate, top with asparagus and egg. Enjoy! This recipe can serve as a base for any ingredients combination. Experiment with different flavors and enjoy!